I remember the day in 1944 when I was 6 years old, and looking at the picture in one of my father's several books of "essential" information. 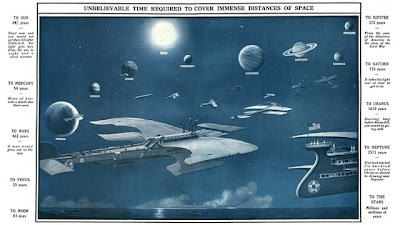 The picture was of biplanes in outer space, along with a timetable of how long it would take for those planes to reach the moon and planets, "traveling at the speed of 50 miles per hour." Now, I'm pretty sure that the authors did their calculations and were being honest, but I didn't see any explanation as to how they reached outer space to begin with. Maybe, just maybe, faith was required for that mystery. Medical information was different then, too. One wouldn't expect present day doctors or NASA to use those texts as guides, as sincere as they were, as "accurate" and "essential" for those times. You can see how this applies to ancient texts. Just as I didn't bother to check out the credentials of the authors or their motives (at 6 yrs. old! ), so believers in the authenticity of scriptural writings don't bother either. What if they were lying or on drugs, stinking drunk, or insane? From some of the things you read in those texts, these explanations seem the only reasonable ones. There is no way to authenticate whether they or a committee wrote those words, and all that IS available are translations of translations. This is even farther from reality than those biplanes in space, and yet people are taught to take those words as authentic. Now, if you're a Catholic, let it be known the Church says that only the ORIGINAL texts are "inspired," which is comparable to saying that it's true because it's in the bible, because the bible says it's true, and avoids the question, "So maybe it's not true at all?" Be very careful whose word you take for things (or what you pray for). You might well ask yourself what the hell we're dealing with. We don't know the writers, their motivations, what they meant because they never explain anything and just expect you to accept their words because they said so - if they really said those words at all. You call this mess, "inspired?" Maybe they believed the moon was made of green cheese or halva or some substance that glows in the dark, and maybe they believed you could get to our moon by floating up - after all, floating up WAS possible then, right? Now, all of these matters deal strictly with writers and the times in which they lived, but what about the moral sense they had? Read for yourself of the atrocities they justified - the mind sets of bigotry, revenge (have you read ALL the psalms? ), and strangleholds against really seeing the world any differently than they interpreted it to be. Why, those fellows didn't even listen to themselves, proofread what they wrote, which is why they contradicted themselves so much. None of the above I‘ve written should be revelatory. Even Timothy Leary commented that the Book of Revelations had to have been written by someone high on drugs, and he knew just what he was talking about, and was a real person. So, just why in the hell do people take these writings seriously, and are willing to participate in ignorance? Maybe it's a case of the more bullshittier it is, the more mysterious and sacred it is held up to be. "Fool me once, shame on you, fool me twice, shame on me," goes the old adage.